1964-72 Pontiac GTO, Lemans, 1964-70 Tempest, 1964-72 Chevelle, 1964-67 Malibu, 68-69 GS 350, 68-69 GS 400, 70-72 Buick GS , 64-72 Skylark, 1964-71 Oldsmobile 442, 1964-72 Olds 85, 1964-72 Cutlass, 1967-72 Cutlass Supreme and more. Perfect finisher for that 100 point concourse restoration. I spent 4 years and a small fortune on an off frame restoration of a 1967 GTO HO 4 speed w/A. Conservatively, 90% of my parts are either NOS or restored originals. All reproduction parts I have are made in the USA and are of the highest quality. Such as my concourse level Gardner dual exhaust. The NOSR gas tank was made in Canada. They only get harder to find, not easier and probably not as good of shape as mine. I was constantly upgrading (even with NOS parts) as I only wanted the best of the best for my project. Body shell was removed from frame... Most of body and all underneath was soda blasted along with entire frame. Frame was painted with correct level of gloss. Body was almost entirely blasted and most major bodywork is already done. Approximately 1/3 of the floors and 2/3 of the trunk pan were replaced with American made steel patch panels engineered to original GM specs and expertly welded into place. Keeping with original factory seams. You will not be able spot the work above or below. Lower quarter skins need work as well as the rear tail panel. Frame was reattached to body using new American made body mounts. Some minor work still needed in package tray area and on lower drivers side rocker arm near door hinge. American made steel Quarter skins will come with car. I have an NOS tailpanel available. Rebuilt/restored Fully dressed 1967 400 Pontiac GTO engine WV code completely restored and rebuilt. Engine and heads were hot tanked and shot peened. Block and heads were magnafluxed. All bolt holes tap chased. Block was bored, honed and decked. Rotating assembly was internally balanced. R&R'd cam bearings and freeze plugs, competition 4 angle valve job, street ported cylinder heads 220/190 cfm's. Opened combustion chambers to 82cc's Rebuilt with Eagle Stroker kit. Street ported 670 heads, port matched stock intake. Competition Cams parts: billet hydraulic roller camshaft, chromemoly pushrods, roller tip rocker arms, valve springs, steel retainers and Viton positive valve stem seals. Double roller time chain set, break in oil, Howards solid roller lifters with pressure fed axle. ARP rocker arm studs, SI severe duty stainless steel valves, BOP engineering poly distributor gear, Mr Gasket cam key, Melling Select high pressure oil pump, BOP engineering rear main seal, Motor Coater high temp engine paint, correct pontiac blue for 1967. Zinc self etching primer, Speed Pro brass freeze plugs, Durabond camshaft bearings, blueprinted oil pump, deburred block, honed lifter bores, line honed cam tunnel, checked kine bore, checked deck height, checked and corrected valve train geometry, degreed cam shaft, cleaned A. Passages in cylinder heads, Block was run on engine stand stand for 90 minutes. Initial timing set to 32 degrees at 3,200 rpm. Checked for water and oil leaks. Cut oil filter apart to check engine health. Checked bearing clearances for rods and mains. Very conservative estimate 430 H.
NOS temp sending unit for cars w/rally gauges and NOS oil pressure sending unit, rebuilt and restored correct Rochester replacement carburetor (7037263) that was specifically tuned for engine build. Rebuilt and restored super rare original distributor (1111252) for H. That was also tuned specifically to engine build. Pump with all correct pulleys, brackets, hoses and Wittek clamps. Ultra rare NOS ignition coil with correct #stamp, Ram Air exhaust manifolds from Ram Air restorations, Correct NOS fan clutch for non AC cars. NOS distributor cap, NOS thermostat, NOS choke housing, Restored and rechromed air cleaner vent tube and correctly rechromed valve covers with restored bolt with correct markings and much much more. This engine was built in mind to get 100 point show car at the Pontiac Nationals. If all you want is the long block, then we can work something out. It will cut the price of the engine in half. I will not break it down less than a long block. In other words, I will not sell just the 670 cylinder heads or intake manifold. These are port matched as stated earlier. Some other items I will be listing are rust free/dent free/bondo free L&R doors, rust free/dent free/bondo free L&R fenders and rust free/dent free/bondo free trunk lid. Nice original GTO hood - not a LeMans hood. NOS tail panel, NOS Harrison 4 core radiator for a 67 GTO, NOS tail lights, Restored 4 speed floor console, Restored dash bezel with restored all original Rally gauges and M&H harness with rare NOS woodgrain veneer piece, NOS L&R parking lamps w/NOS bezels, NOS lenses and NOS correct, painted bulbs. Restored dash pad, restored woodgrain steering wheel with rechromed horn buttons, NOS armrests. From the front and back bumpers, to the vent window A frames, to the rocker panel trim, to the headlamp bezels to the map roof rail reading lamps and everything in between. NOS manual power steering gear box, NOS hood insulation pad, NOS upper/lower control arm bushings, NOS badge emblems, NOS poverty caps, NOS lug nuts, NOS bumper bolts, NOS underhood lamp, NOS glove box lamp, NOS cigar lamp, NOS under dash courtesy lamp, SUPER RARE rebuilt/restored starter correct for 1967 GTO HO and RAM AIR cars (1100853), restored front black bucket seats, unrestored back seat in great original condition and so much more! This is just a sample of what I have. I have hundreds more NOS parts. I know what I have. I know how hard it is to find many of these parts in NOS... I know what they go for and I know how long they take to get restored when restoration is performed by a quality craftsman and not a hack. Please keep that in mind when making an offer. I don't like wasting time haggling. If your offer is fair, I will accept it. If your offer is in the ballpark, I may counter it. If it's too low, you won't get a response. If you're a dealer looking to try and profit off me, I can almost guarantee you won't get a response. I do have some parts available for driver quality cars for those not looking to spend an arm and a leg. I will get around to listing those eventually as well. I will happily respond to serious buyers with serious offers. 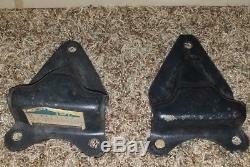 The item "1964-72 GTO, Chevelle, 442, NOS GM Engine Mount Frame Brackets 9773876 9773877" is in sale since Monday, November 26, 2018. This item is in the category "eBay Motors\Parts & Accessories\Vintage Car & Truck Parts\Engines & Components\Motor Mounts". The seller is "lotrfan2012" and is located in Cleveland, Ohio. This item can be shipped to United States, Canada, United Kingdom, Denmark, Romania, Slovakia, Bulgaria, Czech republic, Finland, Hungary, Latvia, Lithuania, Malta, Estonia, Australia, Greece, Portugal, Cyprus, Slovenia, Japan, China, Sweden, South Korea, Indonesia, Taiwan, Thailand, Belgium, France, Hong Kong, Ireland, Netherlands, Poland, Spain, Italy, Germany, Austria, Bahamas, Israel, Mexico, New Zealand, Philippines, Singapore, Switzerland, Norway, Saudi arabia, Ukraine, United arab emirates, Qatar, Kuwait, Bahrain, Croatia, Malaysia, Brazil, Chile, Colombia, Costa rica, Panama, Trinidad and tobago, Guatemala, Honduras, Jamaica, Antigua and barbuda, Aruba, Belize, Dominica, Grenada, Saint kitts and nevis, Saint lucia, Montserrat, Turks and caicos islands, Barbados, Bangladesh, Bermuda, Brunei darussalam, Bolivia, Ecuador, Egypt, French guiana, Guernsey, Gibraltar, Guadeloupe, Iceland, Jersey, Jordan, Cambodia, Cayman islands, Liechtenstein, Sri lanka, Luxembourg, Monaco, Macao, Martinique, Maldives, Nicaragua, Oman, Pakistan, Paraguay, Reunion, Viet nam.